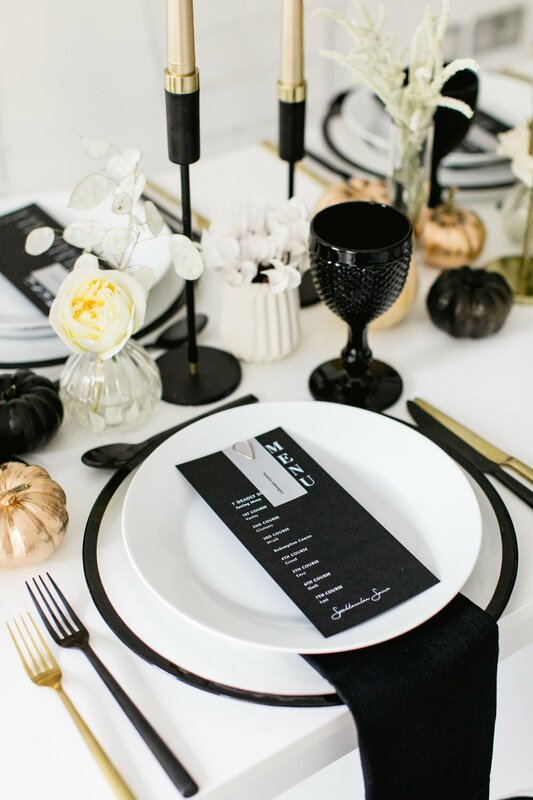 Here at Just Bespoke, we love nothing more than a fun celebration and with Halloween fast approaching, we thought it would be exciting to bring to life some inspiration for a simple but chic All Hallows Eve soiree. We started with a chic invitation by Nat’s Paper Studio that followed the minimalist monochrome vibe we were hoping to create. As guests arrived at the soiree, they were greeted at the front door with a large and abundant pumpkin and twig display. The impressive front door was flanked by an asymmetric bat backdrop comprising over 1000 hand cut black bats to frame the entry! Once inside, our inspiration started with a modern table set for a decadent dinner. 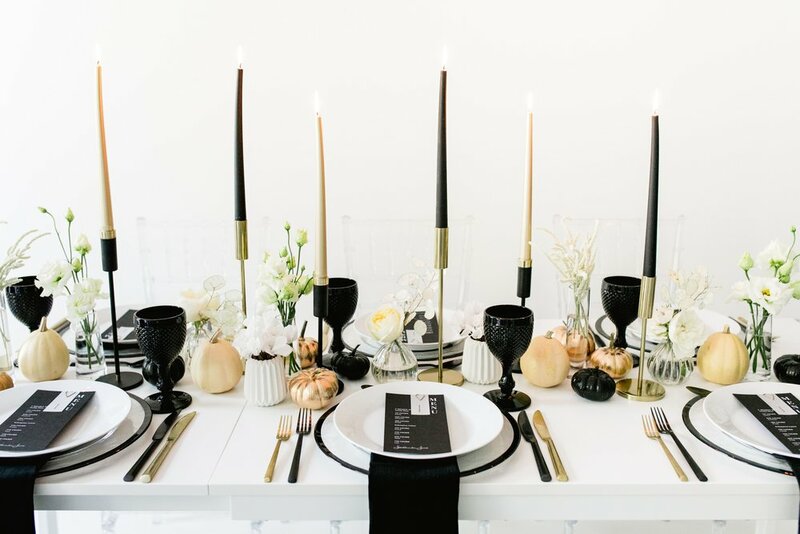 The focus of the meal was most definitely the food, inspired by the seven deadly sins, and so the place settings were kept simple comprising clear black rimmed chargers, black milk glass goblets and black and gold cutlery all provided by Duchess and Butler, as well as black linen napkins. 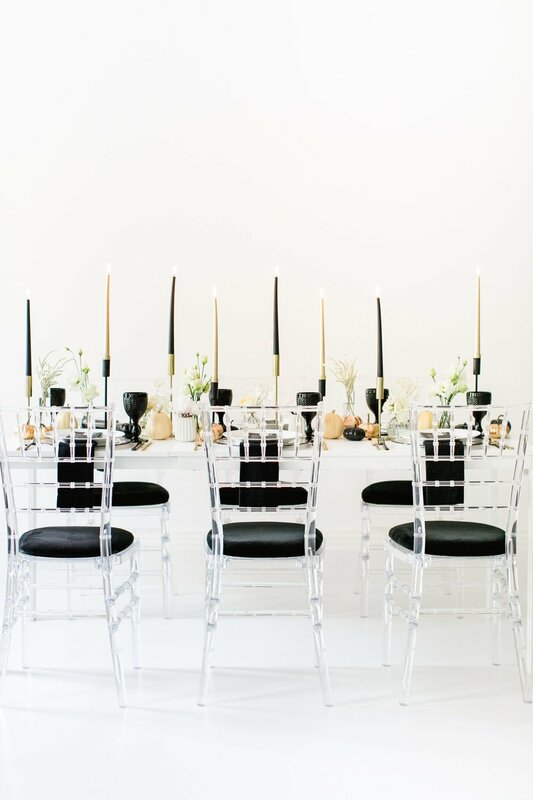 The centrepieces comprised a variety of candles in black, white and gold, to provide height and atmosphere, and these were then interspersed with miniature pumpkins and small bud vases of fresh white florals. The venue had two focal areas that we wanted to accentuate - the feature spiral staircase in the main hallway and the large open fireplace in the living room. The fireplace was adorned with a falling balloon installation created by the Decor Dolls which saw hundreds of balloons in varying tones of black, gold and white - with some spooky eyes thrown in for good measure - spilling out of the fireplace. 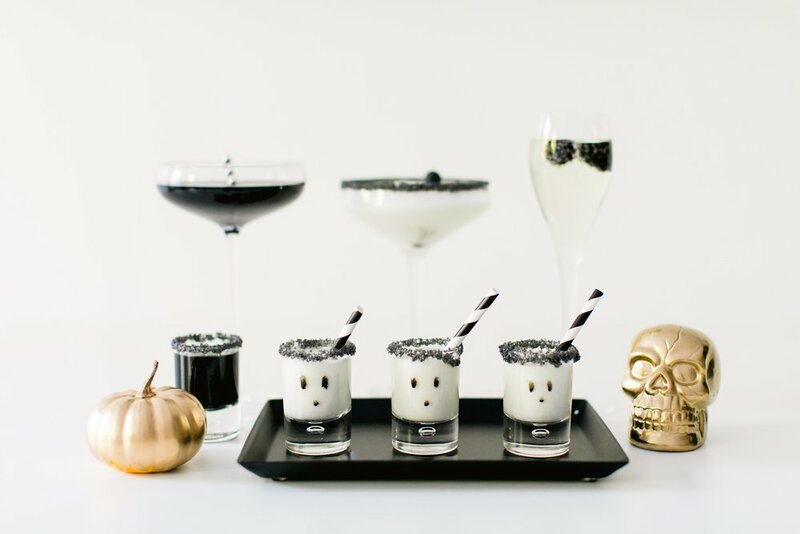 This is not only fun but also a cute way to create some alternative decor for a halloween party. ..., or providing to guests in little goody bags (like our cute Trick or Treat ones) as party favours. The cookies were joined by trays of skull chocolates and a variety of drinks and cocktails. 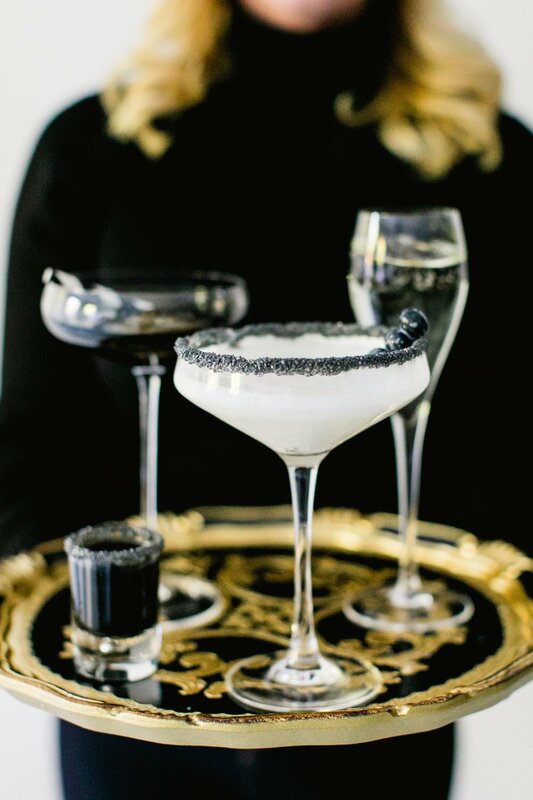 We featured a variety of black and white cocktails complete with black sugar rims to create a visual impact that supported our colour theme. For the staircase, Bloomologie created a flowing pumpkin display, interlaced with various leaves and foliage. 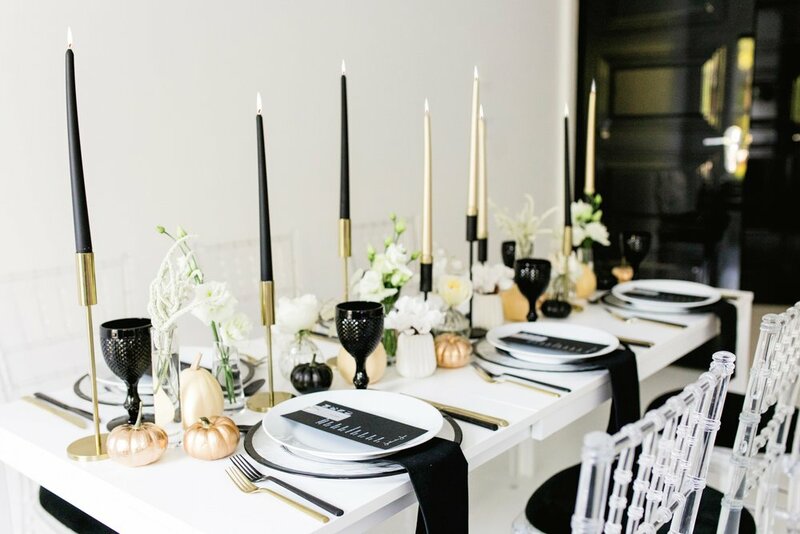 This was then given a sophisticated twist for the evening celebrations by incorporating some black and gold pumpkins as well as some tall taper candles which created a lovely moody ambience. 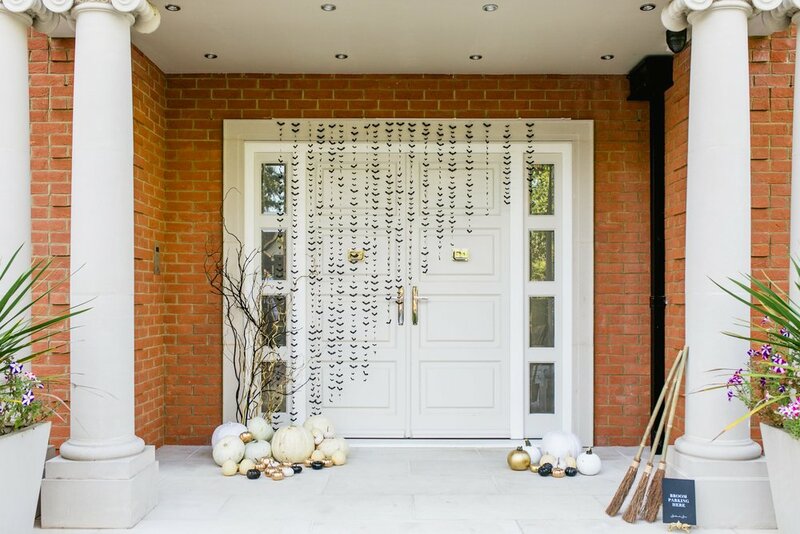 We wanted to create an event which felt sophisticated and stylish and embraced the fun of halloween, whilst also demonstrating how some or all of these ideas can be replicated in the family home to help celebrate All Hallows Eve.